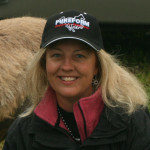 One of my favorite clinicians, Raye Lochert, recently came to Sedro Woolley, WA to teach a clinic at Fire Mountain Trail Course. Created by Marilyn Pineda, this trail training course offers natural obstacles to prepare your horse for outdoor adventures. Raye’s gentle horsemanship methods taught participants to safely maneuver their horses through the obstacles and have fun doing it. I believe horses, and their riders, can get bored with the same old routine every day. It’s my privilege to try all kinds of clinics with my mare April so we can introduce you to new, fun equestrian activities in the northwest. Fire Mountain Trail Course is one of them. Just off Hwy 9, Fire Mountain Trail Course offers a great opportunity to practice obstacle navigation in a safe environment. It’s a place to work your horse with plenty of room and in the safety of an enclosed area. Coaching is available, if desired. With over 35 obstacles to choose from, this is a great way to spend the day working with your horse. When you’re finished, there are miles of great trails right off the location. Currently, this 17-acre horse facility includes an overnight camping area with plenty of room for RV’s, tents and living quarters. There is a porta-potty and water. It’s exciting to see one woman’s dream come true. I highly recommend visiting this outdoor training facility. For more information visit www.firemountainfriesians.com or on Facebook. Raye Lochert Horsemanship can be found at rlhorsemanship.com*. Both Raye and Marilyn will be attending the Lynden Horse Expo so visit their booths for details. Look for more clinics at Fire Mountain Trail Course in the future! Be sure and stop by my booth at the expo as well: October 4-6, 2013 at the Northwest Washington Fairgrounds, Lynden WA. I’d love to meet you in person and hear all about your wellness journey with horses. We’ve included the expo program in this issue of the magazine; there’s a great line-up of clinicians and activities. See you there! Have a great fall and remember to ride!